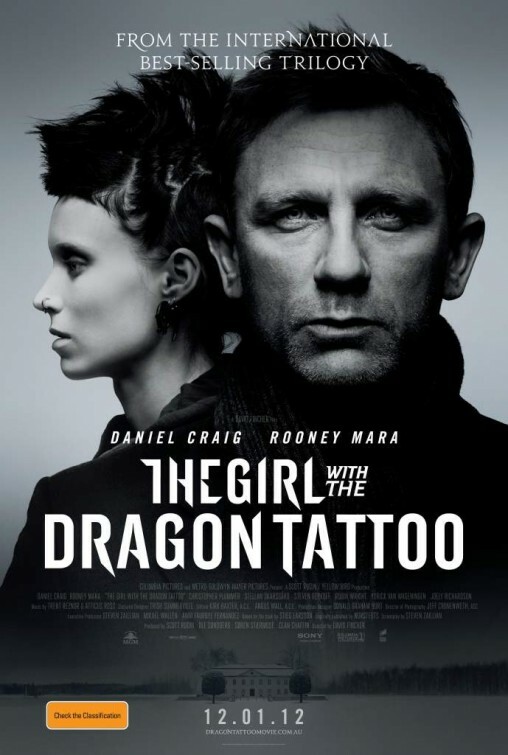 Now on DVD: THE GIRL WITH THE DRAGON TATTOO (US, 2011). 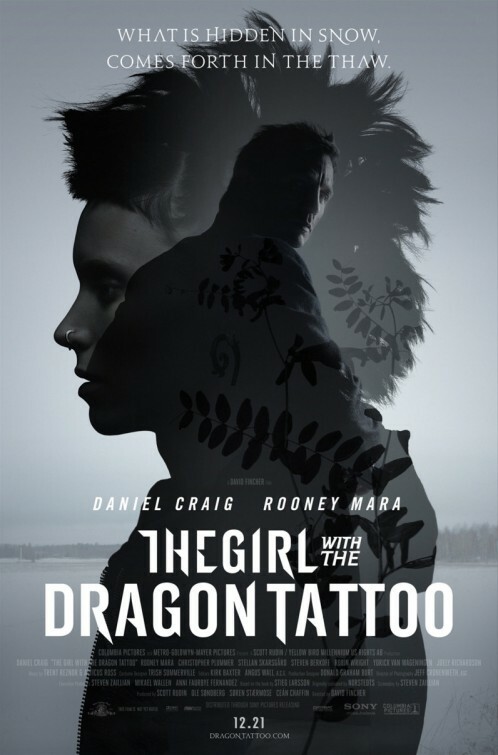 The Girl with the Dragon Tattoo is based on a lengthy novel by Swedish muckraker-turned-fictioneer Stieg Larsson, who famously died before seeing the international phenomenon that became his posthumously-released trilogy of mysteries featuring the now-famous team of disgraced journalist Mikael Blomkvist and disturbed hacker prodigy Lisbeth Salander. The books were turned into a successful series of films in Larsson’s native Sweden, with the role of Lisbeth Salander going to a woman named Noomi Rapace who will soon be seen in the lead role in Ridley Scott’s Prometheus. I haven’t seen any of the Swedish Salander films, but I’ve read the first book, and that’s where I was coming from when I saw the high-profile American version last winter. I was excited when I heard David Fincher was directing from a Steven Zaillian script, although I had a nagging sense of disappointment that such a uniquely talented director was covering such well-trod ground. And I don’t like it when my misgivings are proved correct. 2) There’s plenty of atmosphere, but not that much mystery. This is a testament to the cinematic mastery of Fincher. The man is incapable of shooting a movie that looks and feels anything less than impeccable, precisely-mounted, and absorbing. He makes movies that look better than most movies, yet his images have texture and mood and momentum, all of which make his films feel weightier and realer than just a moving coffee table book of pretty photography. But all the grace in the world can’t lift a story that is lacking. Dragon Tattoo is a mystery at its core — Blomkvist and Salander are hired to investigate a decades-old cold case involving the disappearance of the niece, Harriet, of the mega-wealthy Henrik Vanger (played by the formidable Christopher Plummer.) It’s an Agatha Christie whodunit, a parlor mystery. But rarely in a film of this pedigree (and length) is the list of suspects so limited. Was it Henrik’s nephew, Harriet’s brother Martin (Stellan Skarsgard)? Was it Dirch Frode, Henrik’s attorney (Steven Berkhoff)? Was it Henrik himself? It’s fairly obvious in the book and it’s very obvious in the movie. Casting, baby, casting. Anyone who’s seen a few movies before will quickly pick out the bad guy — which isn’t necessarily a problem, if the story hadn’t spent so much time building to the monumental — and in fact, anti-climactic — reveal. The romance angle in Dragon Tattoo quite frankly isn’t worthy of the Salander character. At best, it plays more like Chasing Amy (where a straight man “converts” a gay woman), really, and I expect more nuance out of David Fincher than I do of Kevin Smith. At worst, it lazily discards all the character work that would make the story original. The final scene of the Dragon Tattoo movie, which I have little trouble spoiling as it spoils the movie all by itself, shows Lisbeth Salander, awesomely vicious warrior of the internet age, excitedly buying a gift for Blomkvist. She goes to give it to him, but instead spots him reconnecting with his longtime paramour, Erika Berger (Robin Wright). Upset by the sight, Salander spitefully tosses the present in the trash, like a jilted schoolgirl, without ever confronting Blomkvist about the betrayal. It’s an egregious end, considering how the fierceness of this character has until this development been the best and (frankly) the most active part of the movie. The Girl With The Dragon Tattoo is much too well-made a movie to have that flawed an ending. Bottom line: Good character, good screenwriting, great acting, great direction, bad story. The last undoes the rest. To make a great movie, as Fincher has done before and will do again, you need all of the elements working in concert. A false note played that loud spoils the entire symphony. Agree. The story is lacking. Zaillian and Fincher have prettied it up and put a nice bow on it, is all. Mara is scary good, you’re right there. Her performance is the one thing I’m most looking forward to about the sequels. I think you should watch the Swedish movies though; they were made for tv but the low budgets and general Scandinavian mood gives them a real grubby feel at times, which I think suits the material better than the Hollywood polish. Laughing At You, Not With You: The Trailer for THE INTOUCHABLES. From The Archives: Some Thoughts On The Trailer For G-FORCE (2009).